One of the best blasters ever and it’s not too hard to see where the inspiration for Katakis came from. This is a blatant R-Type clone, featuring almost identical backdrops and power-ups, right down to the bolt-on/send-ahead drone that does your dirty work for you (or at least some of it). 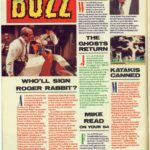 Official R-Type licensees Activision were outraged, and took out a copyright injunction preventing it’s release here in the UK. They went on to release an inferior version of the coin-op, ironically written by the same guys behind this game but in less time. The game was re-written and released under the name Denaris, but lacked some features which made Katakis so good. 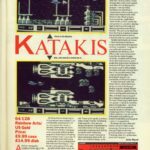 Katakis was actually released in Germany, and some C64 users actually have originals to prove it. Though never officially released in the UK under the same name.